The most potent Fermented Wheat Germ Extract (FWGE) dietary supplement ever produced. The only FWGE that’s gluten-free! Research shows that FWGE helps to redirect energy to healthy cells for renewed vitality, well-being, and enhanced quality of life. Support optimal immune system function. Promote cell metabolic regulation. Maintain healthy appetite, weight, and cell mass. American BioSciences developed a patent-pending combination of technologies used in food processing, which concentrates the “bioactive fraction,” referred to as Fermented Wheat Germ Extract–Super Concentrate (FWGE-SC). Just two easy-to-take capsules are equal to 5.5 g of AveUltra. Safe to take any time of day. Extensive research has shown that Fermented Wheat Germ Extract (FWGE) helps to provide remarkable health benefits for a wide range of serious health challenges, all while empowering the immune system and promoting cellular metabolic regulation. American BioSciences has taken FWGE to the next level by concentrating it to the “bioactive fraction,” termed Fermented Wheat Germ Extract–Super Concentrate (FWGE-SC). By using a patent-pending combination of technologies used in food processing, this bioactive fraction, or FWGE-SC, only contains the active molecules in wheat germ that provide the biological activity and health benefits while excluding non-active and unwanted molecules, such as gluten. This is what makes Metatrol so unique… it contains the power of FWGE but at much more potent and concentrated levels. Super-concentrated – Metatrol is the most potent Fermented Wheat Germ Extract (FWGE) dietary supplement ever produced. Just 2 capsules have the same active ingredients as 1 packet of AvéULTRA. 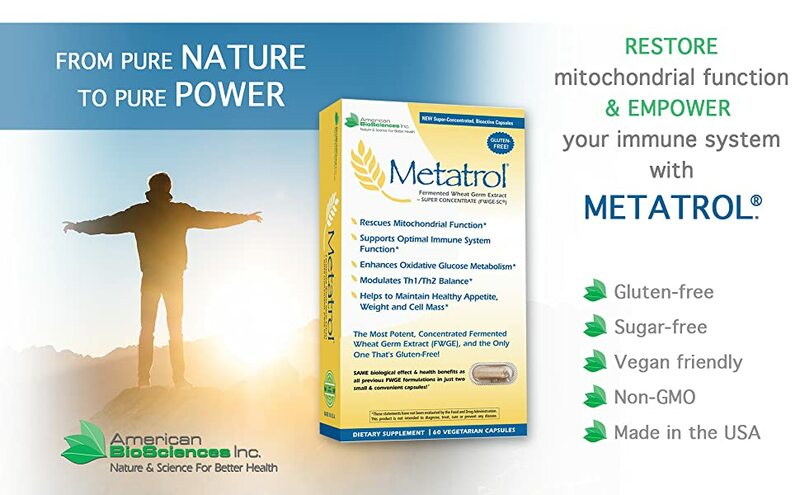 For people with gluten or wheat allergies and sensitivities, Metatrol is the only FWGE that’s gluten-free! Much easier and more convenient to take. No more mixing! Can be taken at any time of day – before, during, or after meals, with or without other medications and supplements. No refrigeration needed. Metatrol capsules are heat stable up to 122°F!